The 2018 edition of Rush Esports is just around the corner. 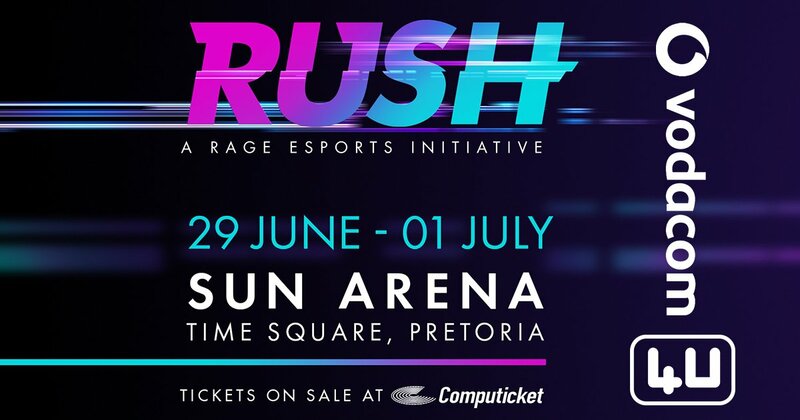 Come the 29th of June, the local esports scene will have all eyes on Time Square in Pretoria as players and spectators kick off a weekend of action. With Vodacom 4U joining as the headline sponsors of the event, and the venue moving from Sandton to Time Square in Pretoria, it’s all change this year. On the agenda is a smorgasbord of titles and activities that aim to balance true esports with easier competitive access for those still dipping their toe in the scene. As a visitor or competitor there is plenty to enjoy and we give you the wrap on what to expect over the three days. Following on the success of last year’s Kaizer Chiefs FIFA tournament, FIFA 18 returns with ACGL on administration and operation duty. On the line is over R13,000 in cash as well as a number of sponsored Huawei items. Players will compete across eight heats over the weekend with the top 32 players returning on Sunday for the grand finals. Registrations have already closed with the entrant limit hit at 320 players. However, spectators can expect to get opportunities to compete for some spot prizes as well as be entertained by a few grudge matches and featured tournament matches all weekend. One of the grudge matches planned will feature YouTuber Samplayze taking on Goliath Gaming’s FIFA player Julio ‘Beast’ Bianchi. Vodacom 4U are also sponsoring the Fortnite 1v1 tournament on mobile devices. Friday and Saturday will be the qualifying days with the top players per day returning on Sunday to play for the R3,500 cash and Huawei products up for grabs. 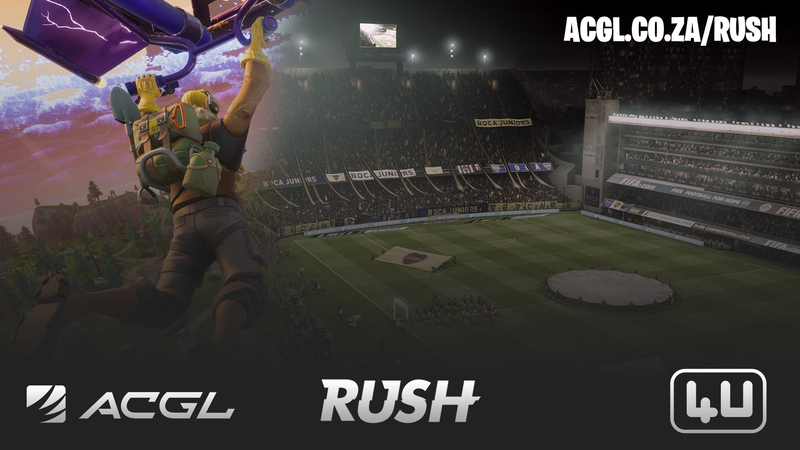 ACGL will be looking after the action on the stage and commentary will be supplied by Samplayze, Grant Hinds and Nick ‘HoldenZA’ Holden. Mettlestate are taking the reigns of the CS:GO tournament at Rush Esports 2018. 16 teams have signed up to battle for the over R42,000 cash and Huawei items on the line. The 16 teams include almost all of South Africa’s best. Energy Esports, Goliath Gaming and Big 5 Esports are all signed up, while Sowetan team Ekasi Esports will be making an appearance in their first major LAN event. The broadcast team for the tournament will feature Mettlestate regulars George ‘GeeMax’ Smith and Barry ‘Anthrax’ Louzada along with Shaun ‘Profeci’ Murrell and Tyler ‘ISOWolf’ Dolan. The host for the event is Chantelle ‘Chani’ Alexander. Gauteng-based gaming venue The Ark Gaming will be on hand with some fighting and racing. On the line in the tournaments – which are open to all registered attendees – will be a variety of products including TVs, headsets and more. Gran Turismo, Street Fighter V and Tekken 7 are on the cards for speed freaks and virtual fighters. Dota 2 is brought to Rush by way of the new online competitive platform, Lobbsta. Attendees can experience the pick up system of Lobbsta with 5v5 matches that will feature a variety of giveaways and spot prizes. 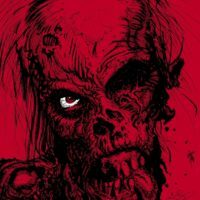 MSI and Evetech are partnering up to bring attendees Quake Champions and Dragonball Fighter Z. There are some pretty tasty MSI items up for grabs, including a gaming notebook, GTX 1080 graphics card, keyboard and more. The Quake Champions tournament will feature Michael ‘axtremes’ Harmse and Matthew ‘HAzE’ Stott on casting duty, while Sean ‘Snare’ Rihlamvu will do likewise for the Dragonball event. Nibble Esports is bringing VainGlory and Hearthstone to Rush. Both games are mobile titles with Hearthstone a 1v1 tournament, while Vain Glory will be a 3v3 event. Razer is sponsoring products for the Hearthstone. There is 9,000 ICE (in-game currency) up for grabs in the VainGlory tournament. A spectator Day Pass is R60 and a spectator Weekend Ticket is R100. Tickets are available at the door or via Computicket. You can find out more about the tournaments – as well as register for them – here.